Troubling Tuesday – Bears and Bears and Bears, Oh My! That is the Bene Gesserit incantation for bravery from Frank Herbert’s "Dune," one of my favorite books. When the markets turn nasty on us it is time to get analytical, not emotional and we need to let our fear pass over us as we step back and evaluate the situation with fresh eyes, and a calm mind. Above is a chart of our major indexes and their year-to-date performance. As we tested our -5% lines last week, we added a fresh round of Disaster Hedges, a series of trade ideas that can make 500% or more if the market falls further and in an afternoon Alert to Members yesterday, we added another SDS hedge with a 400% upside. Having some high-reward hedges in your virtual portfolio allows you to set aside just 2% to protect your entire virtual portfolio against a 10% drop in the markets. 10% is A LOT for the markets to fall and, of course, now that they have brakes on the market, we can always add more hedges along the way down. Should the market fall "just" 5%, we STILL make 10% on our hedges and that nets our virtual portfolio (in this example) UP 5% on a 5% drop in the market. If our bullish plays were also hedged with covers – then so much the better! Most importantly, having a balanced virtual portfolio with hedges allows you to play the market WITHOUT FEAR. Warren Buffett famously advises investors to "Be greedy when others are fearful" and our own PSW Rule #1 is "Always sell into the initial excitement," which doesn’t mean always buy but we look for opportunities to sell fear (naked puts) on a dip, the same way we sell our own positions into spikes up that we consider overdone. Today we get another round of Permanent Open Market Operations. POMOs are the Fed’s way of creating additional bank reserves to finance asset purchases and loans for it’s Primary Dealers (the Gang of 12 or, as David Fry calls them, Da Boyz). GS and Co. then turn around and use this money to fuel their bots to buy equities and we believe we saw a little test run of those programs a couple of times this week as we had very irrational, sharp rallies for no particular reason and I had commented to Members, during chat, that it looked like some Bot testing. 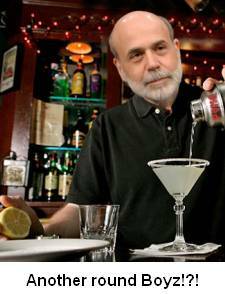 Note that in David’s picture, Bernanke is still playing the role of the generous bartender he played in the hit video "Hayek vs. Keynes – An Economic Smackdown." Note this all ends badly for Keynes but WHAT A PARTY! We made 3 aggressive upside spreads looking for a big finish for the week in yesterday morning’s Alert to Members on SSO, QLD and DDM. Fortunately our timing was good as my call to look for a run once we got past the 10:30 oil inventory report was on the money but then we were very disappointed by the size of the sell-off in the afternoon – even though we were short at that point (we can root for the bulls while betting against them). It’s all about jobs this morning and we need to see less the 450,000 pink slips handed out in the past week to get a little more aggressive. We took a long play on USO at the bottom that did well (and we took money and ran) and we flipped back to bearish at 1:41 with put plays on IWM and DIA that did nicely into the close. As I had said in the morning post – blissful agnosticism! MFE – The security technology company appeared on our ‘hot by options volume’ market scanner this afternoon amid a more than 4% rally in shares to $41.86. Bullish investors hoping for continued upward movement in the price of the underlying looked to get long of calls in the near-term July contract. Traders picked up more than 3,500 call options at the July 45 strike price for an average premium of 22 cents apiece. McAfee shares would need to climb higher by approximately 8% in order for individuals who are now long the calls to breakeven at a price of $45.22 by expiration. Option implied volatility on MFE has risen throughout the trading day from a low of 31% to the current reading of nearly 35%. – McAfee Inc.